Many observers believe that the world is entering a new era of strategic competition among global powers. Disillusion about globalization is leading to more self-interested foreign policies in combination with a rise in national sentiment (Figure 3) fuelled in part by the social pressures described above. Growing nationalism is evident around the world: in Russia, as seen in the Crimea crisis; in India, with the rising popularity of nationalist politicians; and in Europe, with the rise of far-right, nationalistic and Eurosceptic parties in a number of countries. Growth and employment creation are currently expected to remain below pre-crisis levels in both emerging markets and advanced economies, suggesting that the drivers of nationalism will remain strong, and raising the possibility of more frequent and impactful conflicts among states. Importantly, as can be seen in Figure 2, interstate conflict is no longer physical but uses economic means and cyber warfare to attack people’s privacy as well as intangible assets. 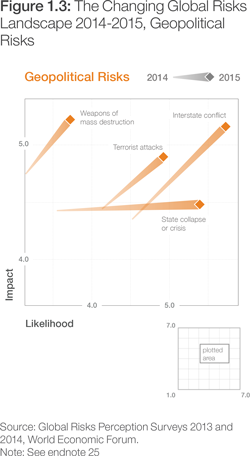 Geopolitical risks can have cascading impacts on other risks. 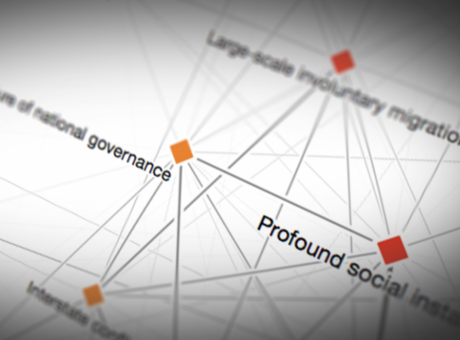 As state structures are challenged by conflict, the risk of the failure of national governance and state collapse or crisis can increase in areas where current state boundaries do not necessarily reflect popular self-identification. A recent example is Iraq and Syria, where ISIS has claimed control of territory and attracted 20,000 to 30,000 fighters from a near standing start.10 The rapid rise and brutality of ISIS as well as the response of the international community may underlie the increased likelihood and impact attributed by respondents to the risk of the deployment of weapons of mass destruction and the higher potential impact than in previous years associated with large-scale terrorist attacks (Figure 1.3). 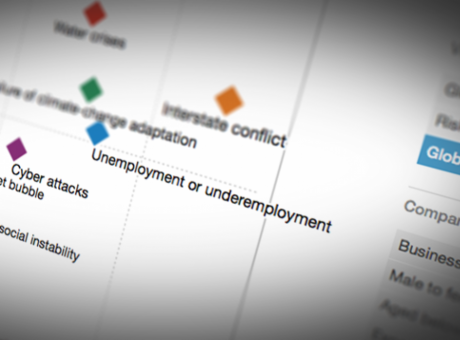 Failure of national governance features strongly this year, as the third most likely risk across the global risks landscape. This risk area captures a number of important elements around the inability to efficiently govern as a result of corruption, illicit trade, organized crime, the presence of impunity and generally weak rule of law. Over past years, the links between many forms of global crime and corruption and their impact on global security, extremism, terrorism and fragile states have only grown stronger, and it is critical to acknowledge and address them through more effective policies that curb illegal financial flows, foster transparent governance and build capacity around anti-crime efforts at the national and local levels. Absent a stronger response from both the public and private sectors, the risk is of undoing hard-earned gains in economic and political stability, and further eroding trust in leadership. In a number of countries, such as India, Indonesia and Romania, new leaders have been elected in large part due to their public commitment to more transparent and corruption-free governance models, underscoring an ongoing shift in public expectations. 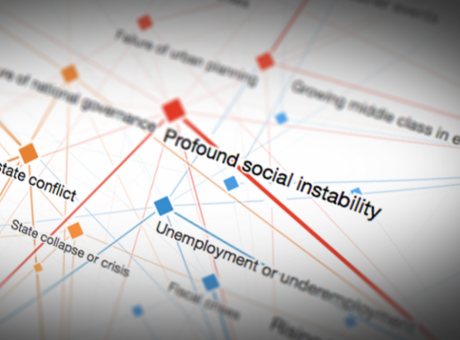 The growing interconnectedness of the global economy increases the economic effects of any geopolitical conflict. Supply chains that run across countries in conflict could be interrupted, leading to disruptions in the availability of goods or energy. Survey respondents considered the risk of an energy price shock to the global economy as more impactful and more likely than in previous years, despite the increasing availability of shale gas or alternative energy sources. 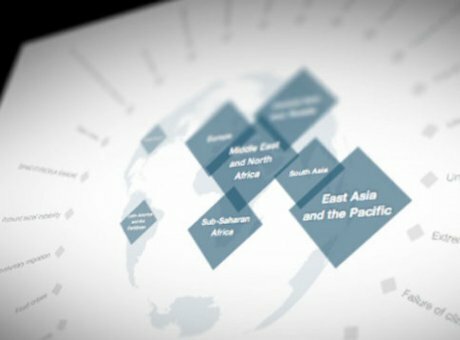 The interplay between economic and geopolitical forces is further explored in Part 2 of this report. Rising nationalist sentiment and declining trust among global players are contributing to a weakening of international governance, undermining the international community’s ability to act decisively on issues such as conflict resolution, Internet governance, climate change and the management of oceans. Failure to collaborate and implement common solutions in these areas could significantly undermine future global growth. The group known as ISIS, ISIL or the Islamic State has gained global notoriety through its taste for video-recorded executions and large-scale atrocity, with a background of further human rights abuse that includes arbitrary imprisonment and sexual enslavement. While its thirst for violence, blood and misery – and especially the way it glories in these crimes – mark it out from other non-state armed forces of our age, this is really only a quantitative distinction. Other groups – many of them part of the global Al Qaeda franchise – do the same, only less. Al Nusra in Syria, Al Qaeda in the Islamic Maghreb and the Nigerian group known in the West as Boko Haram all do some of what ISIS does on a somewhat smaller scale. But what really marks ISIS out is that it has claimed statehood and with that has established some of the machinery of state management. ISIS has not only proclaimed the new Caliphate, the rule of the successors of the Prophet Muhammad – not that it has any theological credibility to do so – but also administers the area of northern Iraq and eastern Syria where it holds sway. It handles law and order, some social services on a selective basis, and has an intelligence service and system of informers set up for it by former officials of the overthrown Ba’athist regime of Saddam Hussein. Adding to the lavish funds it has raised from the Gulf region, it has also taken over and emptied the central bank in Mosul, making it the richest non-state armed force in the world and equipping it to be a non-state state. The phenomenon is not without precedent: the Provisional Revolutionary Government in South Vietnam did much the same in the late 1960s and early 1970s, without the self-glorification of atrocity and terror. And it is not without parallel today. The Taliban have effective control over parts of Afghanistan and was effectively the state in the late 1990s, until the US-led offensive overthrew it in October 2001. Among other examples, for a long time FARC has been in control of large areas of Colombia, while the Seleka militia is in charge of northern areas of Central African Republic. Having withdrawn from Bangui in January 2014 under heavy international pressure, they are recuperating by systematically taxing gold and diamond mining, livestock and other economic activities – behaving in part like a nascent state. Some groups have not based themselves outside the territory over which they are fighting, but have waged warfare that is not territorially limited. In the Al Qaeda mode, they have fought what they perceive to be a global enemy. Today, perhaps the trend is in the opposite direction: re-entry into an era of the non-state state. 10 “Islamic State fighter estimate triples – CIA”, BBC, 12 September 2014; http://www.bbc.com/news/world-middle-east-29169914.